Pulldownit is a dynamics solver which allows for the creation of fractures as well as massive rigid bodies simulations. By using its technology digital artists are able to simulate fast and easily the collapse of buildings, cracking surfaces or fracturing any kind of brittle material. Shatter It is a pre-cutting tool, it is able to generate jaggy fragments, much more realistic than classic polygonal fragments. it is Voronoi-based because this scheme has showed to be the best mathematical pattern for brittle fracture. Its technology allows to pre-cut a 3D model in hundred of shards in seconds, in addition the fragments generated plug easily in the Pulldownit solver to perform simulation in a fast and stable way. The current pre-cutting tools in most 3D platform consist basically in clipping planes and fill holes modifiers; this could be enough for modelling purposes, but definitively quite poor for dynamics where you would like to pre-fracture an object in hundreds of shards to obtain believable results when simulating. 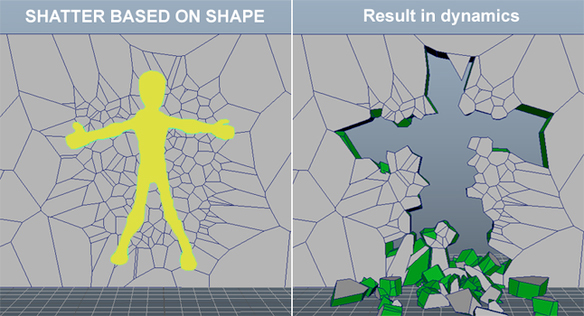 Shatter It!, the new pre-cutting tool by Thinkinetic, is designed thinking in dynamics needs; it is Voronoi-based because this scheme has showed to be the best mathematical pattern for brittle fracture, its workflow is surprisingly easy, just select a polygonal object from the viewport, input the desired number of fragments and hit Shatter It! button, concavity or holes are not an issue anymore; Its technology is able to pre-fracture a high resolution model with fine detail in seconds. In addition, UV mapping is also supported. Shatter It! introduces different cutting styles, Uniform, Local, Path based, Radial and Wood Splinters. Radial style generates a perfect pattern for breaking-glass-like effects, Path-based style allows for the creation of long dynamics cracks and Local style for creating localized damage on corners and surfaces, besides you can combine all of them at your pleasure by continue cutting the generated shards until achieving the desired look. New Jagginess deformer allows to modify the surface of the fragments, converting flat geometry into rough faces and twisted edges, getting a high-realistic look for stucco, stone or concrete materials. Although Shatter It! tool can be used independently of the rest of the plug-in, Its mayor advantages comes when simulating the prefractured object with the Pulldownit solver; the shards created plug easily in dynamics, also knowing Voronoi scheme generates mostly convex shards, Pdi takes advantage of this fact to speed up the computation of fracture. The technology of fracture inside Pulldownit is absolutely new and groundbreaking. It allows fracturing any kind of brittle material like stone, glass or stucco. By using it digital artist are able to simulate the collapse of structures or terrain cracking in minutes. Not the least its easy setup and powerful stress tools allow for control in the creation of cracks and drive the simulation to the desired end. The rigid body solver inside Pulldownit is designed to handle massive simulations, that means thousands of objects in contact. Speed is the first requirement for such a goal; we have improved over the fastest methods in the literature for both mesh and convex detection, Pulldownit computes in real time for scenes made up to 100 objects and take only minutes to simulate thousands of contacts. In addition Pdi! counts with group tools allowing to set up and manage large scenes. Pulldownit solver makes possible to crack dynamically any kind of brittle material like stone, glass or stucco. The set up is very easy, use Shatter it! tool to fracture your object or just build a structure by blocks or pieces of any shape, select all of them as a fracture object and hit play, this procedure also makes the setting of texture coordinates easier. Once in simulation Pulldownit will compute all the stress forces that create cracks and finally makes the objects collapse. Fracture objects can be static as a building or dynamic as a meteor, you can create as many fracture objects as you want, and make them impact each other. Control is always an issue in dynamics simulation, in this sense the powerful stress tools of Pulldownit allow to define the start of the cracks and the way of propagation just by setting fracture frames, in which the crack will begin, and visually select regions of the object with different hardness. Pulldownit is currently integrated into Autodesk 3ds Max and Maya, It catches the geometry from the viewports and computes the final result as animation keys. It allows to reset the simulation and start again as many as needed also tweaking parameters and resume simulation at any frame, in addition, animated objects and characters are able to interact with the simulated ones. Our aim is to fit in the animator’s workflow never the opposite. Pulldownit takes the geometry from the viewports “as is”, special care has been taken with parenting relationships, mesh modifiers and pivot offsets as we know they all are a frequent source of problems. The natural unpredictability of dynamics simulation makes necessary to play with the parameters back and forth until reaching the desired result, Pulldownit not only allows to reset simulation an start again as many as needed but also pause it at any frame, tweaking parameters and resume computing. Force fields as wind, turbulence, attractors or custom fields are supported and interact with PDI objects seamlessly. Pulldownit bakes the simulation as animation keys that can be easily tweaked or exported later to other formats. Finally, as it is usual to have scenes in which animated characters interact with their environment in a physically believable way, Pulldownit allows dynamic response between keyframed objects or deform meshes and the simulated ones. Now you can use any polygonal shape to constraint the shatter effect to its contour, this is especially useful when shattering based on an impact object. Jagginess( v2.0) independent of tessellation. New Jaggy method is independent of the original mesh tessellation, getting much lighter jaggy fragments when the object is hi-poly, and removing the artifacts caused in borders of high tessellated models. New soften edges UI parameter for Jagginess. New parameter to adjust soften of jaggy edges to get the amount of roughness desired in inner faces. In addition new soften method removes visible seems on inner borders from the previous method. New option to apply jaggines to broken fragments only, using this option for non-moving fragments you can apply jagginess only to the areas which has been broken in simulation, getting much lighter meshes for rendering or real-time games. 50% less memory needed for caching simulations. PDI cache is now 50% lighter in CPU memory, that makes massive cached simulations running faster in the viewport. New ability to pull apart pieces of an animated object at the desired frame, besides activating rigid bodies at first hit you can now set the frame when they become active, this works also for rigid bodies linked to an animated one. You can now bake keys only for selected fracture bodies, letting the rest to continue being driven by simulation, baked fractures can still interact with other objects by setting the animated fragments as kinematic bodies. Improved performance of fragments selection in advanced fractures, selection of individual fragments in the viewport is more responsive, especially when Stresses View is enabled. Cluster break energy is now independent of body mass/scale, break energy dependence on body mass made cumbersome to understand its behavior as the same threshold will trigger a blast or not depending on the size of the object, because of this we have removed this dependency and the threshold you set will be valid forever independently of mass or scale. First hit bodies which eventually doesn’t move are excluded from caching and baking, fracture bodies set as “break upon impact” only caches its broken or moving parts and fragments set as static aren’t cached at all, making in this way the size of PDI files smaller especially when you are collapsing only parts of large structures such as buildings. Node-locked - for one machine only, although you can render the final animation in any machine or farm. Floating license - can be used in any machine with as much as one user at the same time, you need and active internet connection while using the plugin. Microsoft Windows 64 bits all versions (Xp, Vista, win7, win 8, win 10). then you can set parallel mode safely. New ability to pull apart pieces of an animated object in dynamics at the desired frame. Viewport 2.0 is supported in Maya 2015, 2016, 2017, however, a few plugin operations perform faster using legacy viewport. See all bug fixes here. But this update is especially about Wood Splinters Shatter, we have developed a new scheme for it so now you get always long, thin splinters even when shattering areas, adding to this a stable dynamics for fracturing wooden objects and the Jaggy feature to apply roughness in the inner faces, you can get quite natural wood destruction effects very fast. PDI keys use 30% less RAM in Maya getting the playback of massive rbd scenes faster.